Rarity and Value: Hugh McCulloch is pictured on each $20 third charter note. If you don’t know yet, then let us be the first to share the good news. 1902 $20 red seals are rare. Only the most common examples will sell for less than $1,000. 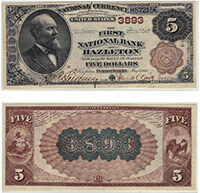 Notes that are high grade or from rare banks could be worth several thousand dollars. Please contact us if you need an exact value. Don’t forget to check the serial number. Number 1 notes always sell for nice premiums. We buy all antique paper money issued by The First National Bank of Oblong, IL. We can tell you how much your $20 bill is worth. We aren’t just dealers. We are also collectors, experts, and appraisers. We have contributed to numerous price guides and are considered specialists in the field of national currency. Contact us via phone or email to get your free appraisal today.